The following dog recipes make delicious treats — whether you decide to stuff them inside a Kong toy, or just serve them up as special homemade treats for your dog… anytime! 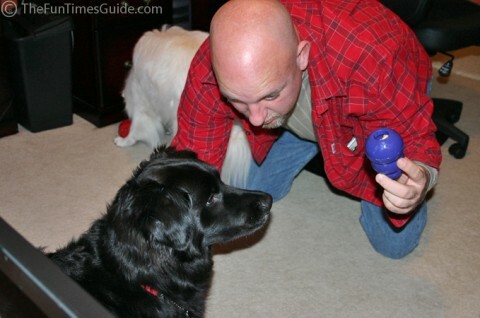 Truth be told… the list of things you can stuff inside of your dog’s Kong toy is virtually endless! You can either make up your own Kong recipes (based on your dog’s personal tastes) using a combination of 2 or more pet-friendly foods, or you can rely on pre-tested fillings that have worked well for others. Following are some great Kong recipes that have worked well for other dog owners. That said, use your own judgment in deciding whether or not to fill your dog’s Kong toy with human foods. Keep in mind… depending on how much food your dog obtains from “working” a Kong toy, you may need to adjust your dog’s diet appropriately, so they’re not getting too many calories from fat, sugar, etc. For starters, see why it’s important to use different kinds of treats each time you stuff your dog’s Kong Toy. And here’s the secret to stuffing a dog Kong toy: use a variety of sticky, ooey, gooey substances! Use your finger to coat the inside of the Kong with something sticky (like peanut butter or honey) then toss medium-sized dog treats inside — the kind that barely fit inside the hole and are hard to get out. Try microwaving some peanut butter or cheese first — this makes it runny and easy to pour into the KONG and leaves very little to waste. Then layer with another food item. Then freeze. The microwaved peanut butter & cheese fills every crack and crevice inside the Kong acting as a glue around the other ingredients making it much more challenging for your dog. Moisten your dog’s dry kibble (either with water, or with some much more flavorful low-salt broth). Then spoon it into the Kong toy. Freeze & serve. Combine your dog’s favorite treat with some moistened dry dog food. Fill the Kong toy, then freeze it… or not. BABYLICIOUS: Mix together some fat-free cream cheese, peanut butter, and either sugar-free applesauce or a jar of baby food (like bananas, carrots). Cram a solid food item into the small hole at the end of the Kong, then fill with the mixture. Seal the large hole with either more cream cheese or peanut butter. PUPPY TRAIL: Fill the Kong with some cashews (unsalted) and freeze-dried liver bits. Add some dry dog food and/or dog crushed dog biscuits and some Cheerios. Drop in a spoonful of peanut butter, followed by some dried fruit. Finally, top it off by using a piece of ravioli or tortellini to close the large opening. IMPORTANT: While it’s perfectly fine to give your dog a Kong toy that just came out of the freezer, it’s NOT okay to give your dog any food item that just came out of the microwave! Make sure any heated items have completely cooled to room temperature before serving to your dog.